Last week Due to Dasara Festival we got a holiday on Thursday, So we thought of going for a bike ride to any near by place from Bangalore, then we got Kolar and its gold fields came in mind, immediately I sent an e-mail invitation to my friends who are free with out going to home town for this festival. Planning a Trip to KGF !!! Hope to reach Bangalore by the same day evening. Kolar Gold Fields (KGF) – (Donga Dongadi movie song – “Manmada rasa Manmada raasa “song shooted here) so come in balck dresses to have some nice photo shoot. Guttahalli - Bangaru Tirupati Venkateshwara Temple is a historically famous well-known pilgrimage center in Karnataka. Bangaru Tirupati is also known as Chikka Tirupati. Route: For reaching kolar we need to take KR Puram Hanging bridge route and continue on old madras road ,then on the way we crossed Basavanapura - Veerenahalli then we reached Hosakote (NH 4) , from there; it’s a straight narrow road to reach kolar.After reaching kolar we need to take the route via Malur taluk, Bangarpet route just follow the direction boards, later we will cross the Bethamangala, we will also cross the Koti Lingeshwara temple to reach Guttahalli. Guttahalli is 39 km from Kolar. Plz call me to confirm the trip …. Note: Please Add more details (like route, things to carry, and places) if you can by consulting your colleagues. Want to have nice one-day trip?? Don’t expect too much, just go in a picnic mood and have fun! ************************************************************************************* ,But Due to some routine reasons like - no holiday for some people and ill health for some others this plan was not able to execute. But all of a sudden on Friday we decide to execute this on Saturday and confirmed the trip …Saturday planned to start around at 6 AM fro Koramnagla(Bangalore) . Started around 7 AM with 4 bikes and 7 people together to Kolar. Following map trace showing the places we covered...Route we followed is Red in color. Don't know what wrong/Bad/Good with this 7 combination we stopped just before K R Puram itself; as one of the bikes gave some trouble. At that time generally no mechanics will be available but we gave a try to check our luck we tried troubleshooting in parallel but of no use. At last decide to get another bike by keeping it in one safe place. After all these problems we started around 8:45 AM and reached Hoskot. In hoskot itself we had very light break fast. (Though idly is deadly for me, I had it because it is my modus operandi while traveling). From mile to mile my ardent eyes are waiting to see Kolar. Indeed we reached Kolar from Hoskot in just 40 mins or less.On the way to Kolar we had small photo session at one stop with nice mountain surrounded by greenery and small ponds … From Kolar junction there are two routes to precede further, one is towards “Antarganga” which is just 5 KM from Kolar junction. Another thing is towards KGF with many places to cover. So we decided to ride our bikes towards “Bangarpeta Junction”. We missed to cover "Antharganga" and "KGF" in this trip …hope we will plan another trip for these two. Soon after crossing Bangarpeta junction we quickly entered into Kommasandra village where we have kotilingeswara temple situated. Really the huge siva linga's awing majesty, so tall, so vast, so high and so big ... It was awesome. And the Nandi before this Linga is awe-inspiring ion this sight. Along with this big siva linga there were more than 86 lacs of small and medium size lingas placed all the way in village. And my joy has no limits when I saw these many lingas together in one place. I totally forgot my hunger and journey strains in the situation. There is a custom that those who loves and belive in shiva will place a linga in temple premises. One of my friends told me that temple authorities are helping people to do so by charging just 3,500 R/- which is very less. And peoples believe that shiva here is famous for giving boons for child less people(barren women )and un-married people. And there is a tree to which people are tying “Mangala Sutra” and “Uuyala” (swing) as they believe that by doing so shiva will shower his boons to get rid of their obstacles. Of course Shiva’s grace and blessings will be always be there for people who believe him. After this place I mount up on my Pulsar to move towards "Bangaru Tirupathi". And it is just 7 KM far from this place. And it is Lakshmi sametha sri venkateswara swami alayam. The above snap is captured showing a bird taking shelter behind Sri Maha Vishnu. "God Tussi Great Ho". The pond here in this temple is really good. I felt happy when I saw some kids enjoying splashes in that pond. And just before entrance the big eagle statue is too attractive. Then we moved further towards "Avani", though the entire route between Bangaru Tirupathi and Avani is on paddy fields the route is so good and we were geared up to 70 KMPH. The grenary smell is so pleasant all the route; it is just like riding bike in new world. Bad luck is - The Ramlayam was closed. But we were able to visit sarda devi temple just before Ramalayam. And the golden snap shown beside is captured on the door of the Ramlayam. That is showing date in the year 1917, still the doors are so strong. There we were greeted with sprinkled rain. We relaxed in the temple it self for some time discussing about Ramyana. 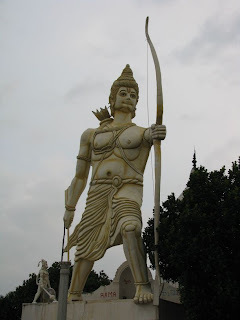 The Rama statue isolated from main temple situated exactly opposite to it is some thing special to my eyes; when I sat before the statue, I went into littile trans - thinking about so many things. 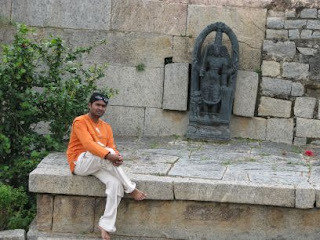 The below snap is taken when I sat before that Rama Statue. After rain stopped, we quickly moved to visit some other place. But it is almost 3:30 PM at that time so thought of planning optimmaly. We enquired the villagers there to find out the shortest route to visit Kurudmali and from there to Bangalore High-way. On the way to the next place we had some food in a dhaba; as we don't even thought of taking lunch till that time.We got a best short-cut route to go to Kurudmali and we reached there around 4: 10 PM quickly we entered the temple. I was totally surprised by seeing the huge ganesh idol. After finishing archana and darshan we simple filled our minds with pleasant feeling when saw the Ganesh there finally to store it all through the life. I think this is the biggest rock idol I have ever seen in a anicinet temple. and looks like the temple construction is made in ages back. I observed steps inside the temple, may be required to decorate the idol as it is sucha tall one.While coming out from the tmeple I came to know that this temple is pretty famous with the visit of many politicians. Again we were greeted by the cold breeze and sprinkles. And we started our return journey around at 6 PM from temple towards Bangalore. We raced all the way and reached Bangalore around at 8:00 PM. On the way back to bangalore from Kolar we found this pleasant RAMA statue, and some of us had small photo shoot there and continued our race. Actullay we felt bit bad - as we missed to cover "Anthar ganga and KGF". But we felt it latter like one good thing as we can have another road trip to these places soon. And this is my Friends narration about the same, Click here to view. 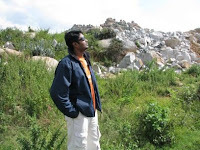 9 comments to "Trip to Kolar, Kotilingeshwara, Bangaru Tirupati, Aavani, Kurudumale"
excellent blog. very helpful with all the route details. nehw vry in4mative.. it helpd me decide r plan..... hope it wrks out..! In your post under `nearby places` you have written `bangaru tirupati` also known as ` chikka tirupati`.But, `chikka tirupati` is near Malur, which I recently visited.May I request you to kindly verify and make correction? thanks guys!! i had been searching for a place to visit in a weekend and accidentaly found your blog.. looks like i would be following this shortly. not this weekend but the next one!! this will make one of our weekends for sure very shortly.. thanks for all the info! !